Martin Luther King Jr. acknowledges the crowd at the Lincoln Memorial for his "I Have a Dream" speech during the March on Washington, Aug. 28, 1963. Americans on Monday celebrate Martin Luther King Jr. Day, honoring a man who embodied the U.S. civil rights movement and who understood that the success of the movement depended on its nonviolent principles. Every year on the third Monday in January, Americans honor the slain civil rights leader who in the 1950s and 1960s organized nonviolent protests against Southern segregation, the struggle for black equality and voting rights. U.S. President Donald Trump marked the holiday largely out of public view at his private golf resort in Florida. He dedicated his weekly address to the country, released on Monday, to King. "Dr. King's dream is our dream. It is the American dream," Trump said. Two of King's children publicity criticized Trump in speeches on Monday, following accusations last week that he described immigrants from Haiti, El Salvador and Africa as coming from "s---hole countries." Trump also reportedly expressed a preference for immigrants from countries such as Norway. King's daughter, Rev. Bernice King, told a service at Atlanta's Ebenezer Baptist Church "we cannot allow the nations of the world to embrace the words that come from our president as a reflection of the true spirit of America." Since the alleged remarks, Trump has been widely condemned as a racist — an accusation he has denied. "I am the least racist person you will ever interview," Trump said, responding to a reporter's question Sunday at his Mar-a-Lago resort in Florida. Many around the country spend the holiday commemorating King's tireless work to end racism by participating in community service projects. The U.S. Congress honored that community spirit in 1994 by designating the King holiday as a national day of service. King rose to prominence in the mid-1950s when as a young preacher he led the successful drive to desegregate public buses in Montgomery, Alabama, forcing the city to end its practice of segregating black passengers. By August 1963, the push for equality had grown significantly across the country and 250,000 people, both black and white, traveled to the nation's capital to participate on the March on Washington. The protest was peaceful with no arrests. The Rev. 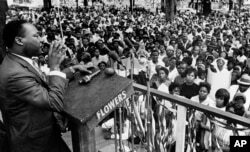 Martin Luther King Jr. addresses a crowd of some 3,000 persons, April 30, 1966, in Kelly Ingram Park on the last day of his three-day whistle-stop tour of Alabama. King’s famous “I Have a Dream” speech launched what had been a mostly black Southern movement into a nationwide civil rights campaign. King understood that a key to success for the civil rights movement was a strategy of nonviolent protests, which he championed as an alternative to armed uprising. King has said he was inspired by the teachings of Indian leader Mahatma Gandhi. Rev. 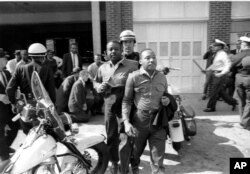 Ralph Abernathy and Martin Luther King, Jr., are taken by a policeman as they led a line of demonstrators into the business section of Birmingham, Alabama, April 12, 1963. The movement was tested in places like Birmingham, Alabama, where police used attack dogs and fire hoses to disperse protesting school children and in Selma, Alabama, where a 1965 march is remembered as “Bloody Sunday” because police attacked protesters. Televised footage of violence against civil rights demonstrators sparked a wave of sympathetic public opinion. Just weeks after the large and peaceful March on Washington, tragedy hit Birmingham when a bomb exploded at the 16th Street Baptist Church during Sunday school classes. Four young girls were killed and 23 others injured. Some blacks wanted to retaliate, including members of the revolutionary group known as the Black Panthers. 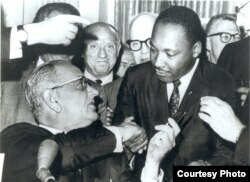 However, the steady and peaceful nonviolent movement held its course and came to a crescendo in 1964, when President Lyndon Johnson signed the Civil Rights Act outlawing racial segregation in public places and King won the Nobel Peace Prize. Photograph of President Lyndon Johnson signing the Voting Rights Act as Martin Luther King, Jr., with other civil rights leaders in Washington, DC, August 6, 1965. The following year, the Voting Rights Act banned practices that were used to keep blacks from participating in elections. King’s own life ended in violence when he was assassinated in 1968 in Memphis, Tennessee, where he was supporting striking sanitation workers. King, who was 39 years old when he died, gave a speech the night before his death that foreshadowed his assassination. “And I have seen the Promised Land. I may not get there with you, but I want you to know tonight that we as a people will get there,” he said. Four days after King’s assassination, a congressman proposed a federal holiday honoring King. However, it took more than 15 years for that to happen. In 1979, after 10 years of petitions from millions of citizens, lawmakers held an official hearing to discuss the idea of a King holiday. That first initiative failed, with many opponents questioning whether King deserved the same respect as George Washington, the nation’s first president who is honored with a federal holiday.